We’re not the first council in the country to take this approach; colleagues in Sheffield agreed last week to terminate their contract with Veolia and provide waste services in a different way and in 2015 Liverpool City Council ended its contract with Amey and set up a new company to deliver services. The reason, I suspect, is the unprecedented financial position local authorities find themselves in, and the constant need to ensure that every penny we spend is achieving value for money and offering the best possible services for our residents. Although I’d like to thank Amey for its commitment to providing services for the residents of Peterborough during the past five years, it is clear that the contract is no longer meeting both our needs and we now have the opportunity to move forward to meet the changing needs of our city. There are a number of ways we believe we could make significant savings if we had more control over the way services are provided. Take recycling - it costs us more to treat waste in the city’s energy recovery facility than it does to recycle. So, If we can encourage more people to recycle then we would not have to pay so much in treatment costs, generating a saving for the council to spend on services for residents. We’ll also look to increase the income we generate from commercial services and agree terms which allow us to keep a greater share of this income - currently all this income goes to Amey. This could include providing trade waste for more businesses and offering cleaning services to private landowners. There are many ways we can make money by selling the services that Amey currently provides and we will be looking to maximise these. Regardless of the decision that is made, waste and street cleaning services will continue to be operated by Amey until a new service provider is in place. We also know this will be an uncertain time for Amey’s staff and we are committed to consulting with them on any proposed changes if Cabinet and Council approves the mutual termination of the existing contract. 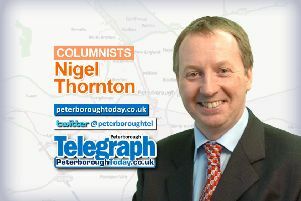 I’ll be able to tell you more about the wider phase two budget proposals in next week’s column. Hard copies of the budget proposals document and questionnaire will be available on Town Hall and Bayard Place receptions and in each of the city libraries by the formal launch of the consultation on Monday 6 February 2017. If you know of a community group or project in need of funding, point them in the direction of Viridor which has this week launched a new community fund. Viridor runs our energy recovery facility (ERF) at Fengate, which saves the city £1million a year by treating our non-recyclable waste as opposed to sending it to landfill. You can find out more about the Viridor in Peterborough Fund by visiting www.viridor.co.uk. It’s certainly worthwhile finding out more as it offers funding of £20,000 a year for worthy causes. In addition, Viridor will be putting in an additional top-up of £1 for every tonne of waste brought to the ERF which is not part of the council contract.